Sprouted grains and foods that contain sprouted grains have been “sprouting up” in grocery and health-food stores lately. Curious about what sprouted grains really are and if you should be eating them? Have you come across “sprouted-grain cereal” or “sprouted-grain bread” in your grocery store and wondered what it is? Food companies that manufacture sprouted-grain products claim that these foods are more nutritious than other grain products and can help improve health. Is there any truth to these claims? First, a bit of background on grains. Grains are the seeds of plants, such as those from cereal grasses. Oats, barley, wheat, corn, and rice are examples of grains. The grain has three edible parts — the germ, endosperm, and bran. The germ is the plant embryo that feeds on the starchy endosperm. The bran layer provides nutrients and some protection, along with the outer husk (that we don’t eat). There are special growth-inhibitors in the grain that keep it from sprouting and turning into a plant until the conditions are just right. When the germ, or embryo, is ready to start sprouting, enzymes kick in and turn the starch of the endosperm into more easily “digested” molecules to help the plant grow. The outer bran of the seed splits open and you can see a small shoot poking out. This is what a sprouted grain looks like! Easier digestion. One of the claims about sprouted grains is that they are easier to digest (at least, for some people) than regular grains. There may be some truth to this. A young plant that still is growing is more easily able to “digest” the endosperm, thanks to those enzymes mentioned above. So, not surprisingly, sprouted grains may be a little easier on the stomach than regular grains — this means less stomach upset and less bloating. More nutrients. Sprouted grains contain more of certain nutrients than regular grains. For example, they’re higher in B vitamins, vitamin C, folate, fiber, and essential amino acids (the building blocks of protein). Sprouting also makes it easier for the body to absorb nutrients, such as calcium and iron, in the digestive tract. Less carbohydrate, more protein. Sprouted grains aren’t carb-free, but because sprouting decreases the amount of starch in grains, they contain less carb. And the proportion of protein is a bit higher. This, in turn, can make sprouted grains a good choice for people who have diabetes. More fiber. Sprouted grains contain more soluble fiber than regular grains. Soluble fiber is a type of fiber that absorbs fluids in the digestive tract, helping you feel more full. This kind of fiber can also help lower cholesterol and blood sugar levels. More research is needed, but a few studies have shown that eating sprouted grains may be helpful for certain medical conditions. For example, sprouted brown rice has been shown to help lower blood sugar levels and boost “good” (HDL) cholesterol in people with diabetes. Sprouted buckwheat lowered blood pressure in rats and reduced fatty liver in mice. But it’s still the early days and more studies are needed to better learn the role of sprouted grains on health. Of note, it’s important to keep in mind that sprouted grains contain less gluten, but they’re not gluten free (unless the grain is gluten-free to begin with). So sprouted wheat or barley still contain gluten. If you have celiac disease or have a gluten sensitivity, you should continue to avoid eating these grains. Most sprouted grains, such as rice, barley, and wheat are ground up and cooked into bread, pasta, or cereal. Be careful about eating raw sprouted grains or beans (like mung beans or chickpeas, for example), as the sprouting process can encourage the growth of bacteria. Cooking will destroy the bacteria, however. Your local supermarket or health-food store likely carries sprouted grain foods. Brand names to look for include Food for Life, Essential Eating Sprouted Foods, Shiloh Farms, and Alvarado Street Bakery. You can purchase foods from some of these companies directly from their websites if you’re unable to find them locally. 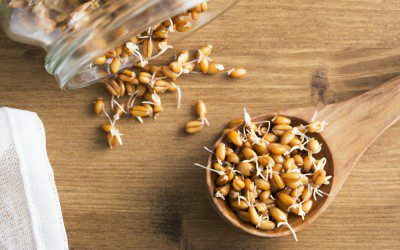 You can easily sprout your own grains at home, and it’s a fun activity if you have kids. For easy instructions, visit the website the kitchn. You can also find recipes using sprouted grains on the Whole Grains Council’s website. Have Type 2 diabetes and interested in the chance to win a meeting with a certified diabetes educator? You’ll want to enter the My Diabetes Dream Team Sweepstakes. Bookmark DiabetesSelfManagement.com and tune in tomorrow to learn more.